Peptic ulcer disease (PUD), also known as a peptic ulcer or stomach ulcer, is a break in the lining of the stomach, first part of the small intestine, or occasionally the lower esophagus. An ulcer in the stomach is known as a gastric ulcer while that in the first part of the intestines is known as a duodenal ulcer. The most common symptoms of a duodenal ulcer is waking at night with upper abdominal pain or upper abdominal pain that improves with eating. With a gastric ulcer the pain may worsen with eating. The pain is often described as a burning or dull ache. Other symptoms include belching, vomiting, weight loss, or poor appetite. About a third of older people have no symptoms. Complications may include bleeding, perforation, and blockage of the stomach. Bleeding occurs in as many as 15% of people. Common causes include the bacteria Helicobacter pylori and non-steroidal anti-inflammatory drugs (NSAIDs). Other less common causes include tobacco smoking, stress due to serious illness, Behcet disease, Zollinger-Ellison syndrome, Crohn disease and liver cirrhosis, among others. Older people are more sensitive to the ulcer causing effects of NSAIDs. The diagnosis is typically suspected due to the presenting symptoms with confirmation by either endoscopy or barium swallow. H. pylori can be diagnosed by testing the blood for antibodies, a urea breath test, testing the stool for signs of the bacteria, or a biopsy of the stomach. Other conditions that produce similar symptoms include stomach cancer, coronary heart disease, and inflammation of the stomach lining or gallbladder. Diet does not play an important role in either causing or preventing ulcers. Treatment includes stopping smoking, stopping NSAIDs, stopping alcohol, and medications to decrease stomach acid. The medication used to decrease acid is usually either a proton pump inhibitor (PPI) or an H2 blocker with four weeks of treatment initially recommended. Ulcers due to H. pylori are treated with a combination of medications such as amoxicillin, clarithromycin, and a PPI. Antibiotic resistance is increasing and thus treatment may not always be effective. Bleeding ulcers may be treated by endoscopy, with open surgery typically only used in cases in which it is not successful. Peptic ulcers are present in around 4% of the population. They newly began in around 53 million people in 2013. About 10% of people develop a peptic ulcer at some point in their life. They resulted in 301,000 deaths in 2013 down from 327,000 deaths in 1990. The first description of a perforated peptic ulcer was in 1670 in Princess Henrietta of England. H. pylori was first identified as causing peptic ulcers by Barry Marshall and Robin Warren in the late 20th century, a discovery for which they received the Nobel Prize in 2005. 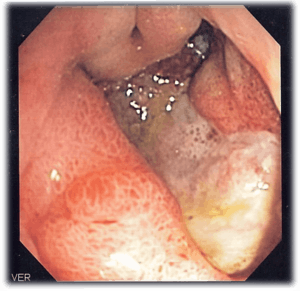 In patients over 45 with more than two weeks of the above symptoms, the odds for peptic ulceration are high enough to warrant rapid investigation by esophagogastroduodenoscopy. The timing of the symptoms in relation to the meal may differentiate between gastric and duodenal ulcers: A gastric ulcer would give epigastric pain during the meal, as gastric acid production is increased as food enters the stomach. Symptoms of duodenal ulcers would initially be relieved by a meal, as the pyloric sphincter closes to concentrate the stomach contents, therefore acid is not reaching the duodenum. Duodenal ulcer pain would manifest mostly 2–3 hours after the meal, when the stomach begins to release digested food and acid into the duodenum. Also, the symptoms of peptic ulcers may vary with the location of the ulcer and the patient's age. Furthermore, typical ulcers tend to heal and recur and as a result the pain may occur for few days and weeks and then wane or disappear. Usually, children and the elderly do not develop any symptoms unless complications have arisen. Perforation (a hole in the wall of the gastrointestinal tract) often leads to catastrophic consequences if left untreated. Erosion of the gastro-intestinal wall by the ulcer leads to spillage of stomach or intestinal content into the abdominal cavity. 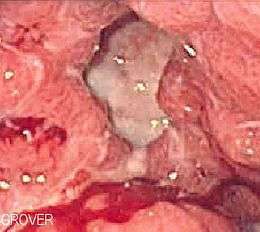 Perforation at the anterior surface of the stomach leads to acute peritonitis, initially chemical and later bacterial peritonitis. The first sign is often sudden intense abdominal pain; an example is Valentino's syndrome, named after the silent-film actor who experienced this pain before his death. Posterior wall perforation leads to bleeding due to the involvement of gastroduodenal artery that lies posterior to the first part of the duodenum. Gastric outlet obstruction is a narrowing of the pyloric canal by scarring and swelling of the gastric antrum and duodenum due to peptic ulcers. The person often presents with severe vomiting without bile. A major causative factor (60% of gastric and up to 50–75% of duodenal ulcers) is chronic inflammation due to Helicobacter pylori that colonizes the antral mucosa. The immune system is unable to clear the infection, despite the appearance of antibodies. Thus, the bacterium can cause a chronic active gastritis (type B gastritis). Gastrin stimulates the production of gastric acid by parietal cells. In H. pylori colonization responses to increased gastrin, the increase in acid can contribute to the erosion of the mucosa and therefore ulcer formation. Another major cause is the use of NSAIDs, such as ibuprofen and aspirin. The gastric mucosa protects itself from gastric acid with a layer of mucus, the secretion of which is stimulated by certain prostaglandins. NSAIDs block the function of cyclooxygenase 1 (cox-1), which is essential for the production of these prostaglandins. COX-2 selective anti-inflammatories (such as celecoxib or the since withdrawn rofecoxib) preferentially inhibit cox-2, which is less essential in the gastric mucosa, and roughly halve the risk of NSAID-related gastric ulceration. Stress due to serious health problems such as those requiring treatment in an intensive care unit is well described as a cause of peptic ulcers, which are termed stress ulcers. While chronic life stress was once believed to be the main cause of ulcers, this is no longer the case. It is, however, still occasionally believed to play a role. This may be by increasing the risk in those with other causes such as H. pylori or NSAID use. Gastrinomas (Zollinger–Ellison syndrome), rare gastrin-secreting tumors, also cause multiple and difficult-to-heal ulcers. More specifically, peptic ulcers erode the muscularis mucosae, at least to the level of the submucosa (contrast with erosions, which do not involve the muscularis mucosae). One of the reasons that blood tests are not reliable for accurate peptic ulcer diagnosis on their own is their inability to differentiate between past exposure to the bacteria and current infection. Additionally, a false negative result is possible with a blood test if the patient has recently been taking certain drugs, such as antibiotics or proton-pump inhibitors. The breath test uses radioactive carbon to detect H. pylori. To perform this exam the patient will be asked to drink a tasteless liquid which contains the carbon as part of the substance that the bacteria breaks down. After an hour, the patient will be asked to blow into a bag that is sealed. If the patient is infected with H. pylori, the breath sample will contain radioactive carbon dioxide. This test provides the advantage of being able to monitor the response to treatment used to kill the bacteria. A gastric peptic ulcer is a mucosal defect which penetrates the muscularis mucosae and lamina propria, produced by acid-pepsin aggression. Ulcer margins are perpendicular and present chronic gastritis. During the active phase, the base of the ulcer shows 4 zones: inflammatory exudate, fibrinoid necrosis, granulation tissue and fibrous tissue. The fibrous base of the ulcer may contain vessels with thickened wall or with thrombosis. Younger patients with ulcer-like symptoms are often treated with antacids or H2 antagonists before endoscopy is undertaken. People who are taking nonsteroidal anti-inflammatories (NSAIDs) may also be prescribed a prostaglandin analogue (misoprostol) in order to help prevent peptic ulcers. H2 antagonists or proton-pump inhibitors decrease the amount of acid in the stomach, helping with healing of ulcers. When H. pylori infection is present, the most effective treatments are combinations of 2 antibiotics (e.g. clarithromycin, amoxicillin, tetracycline, metronidazole) and a proton-pump inhibitor (PPI), sometimes together with a bismuth compound. In complicated, treatment-resistant cases, 3 antibiotics (e.g. amoxicillin + clarithromycin + metronidazole) may be used together with a PPI and sometimes with bismuth compound. An effective first-line therapy for uncomplicated cases would be amoxicillin + metronidazole + pantoprazole (a PPI). The lifetime risk for developing a peptic ulcer is approximately 10%. They resulted in 301,000 deaths in 2013 down from 327,000 deaths in 1990. In Western countries the percentage of people with Helicobacter pylori infections roughly matches age (i.e., 20% at age 20, 30% at age 30, 80% at age 80 etc.). Prevalence is higher in third world countries where it is estimated at about 70% of the population, whereas developed countries show a maximum of 40% ratio. Overall, H. pylori infections show a worldwide decrease, more so in developed countries. Transmission is by food, contaminated groundwater, and through human saliva (such as from kissing or sharing food utensils). A minority of cases of H. pylori infection will eventually lead to an ulcer and a larger proportion of people will get non-specific discomfort, abdominal pain or gastritis. Peptic ulcer disease had a tremendous effect on morbidity and mortality until the last decades of the 20th century when epidemiological trends started to point to an impressive fall in its incidence. The reason that the rates of peptic ulcer disease decreased is thought to be the development of new effective medication and acid suppressants and the discovery of the cause of the condition, H. pylori. The incidence of duodenal ulcers has dropped significantly during the last 30 years, while the incidence of gastric ulcers has shown a small increase, mainly caused by the widespread use of NSAIDs. The drop in incidence for duodenal ulcers is considered to be a cohort-phenomenon independent of the progress in the treatment of the disease. The cohort-phenomenon is probably explained by improved standards of living which has lowered the incidence of H. pylori infections. The H. pylori hypothesis was initially poorly received, so in an act of self-experimentation Marshall drank a Petri dish containing a culture of organisms extracted from a patient and five days later developed gastritis. His symptoms disappeared after two weeks, but he took antibiotics to kill the remaining bacteria at the urging of his wife, since halitosis is one of the symptoms of infection. This experiment was published in 1984 in the Australian Medical Journal and is among the most cited articles from the journal. 1 2 3 4 5 6 7 8 9 10 Najm, WI (September 2011). "Peptic ulcer disease.". Primary care. 38 (3): 383–94, vii. doi:10.1016/j.pop.2011.05.001. PMID 21872087. ↑ "Definition and Facts for Peptic Ulcer Disease". National Institute of Diabetes and Digestive and Kidney Diseases. Retrieved 28 February 2015. ↑ Rao, S. Devaji (2014). Clinical Manual of Surgery. Elsevier Health Sciences. p. 526. ISBN 9788131238714. 1 2 3 Milosavljevic, T; Kostić-Milosavljević, M; Jovanović, I; Krstić, M (2011). "Complications of peptic ulcer disease.". Digestive diseases (Basel, Switzerland). 29 (5): 491–3. doi:10.1159/000331517. PMID 22095016. 1 2 Steinberg, KP (June 2002). "Stress-related mucosal disease in the critically ill patient: risk factors and strategies to prevent stress-related bleeding in the intensive care unit.". Critical Care Medicine. 30 (6 Suppl): S362–4. doi:10.1097/00003246-200206001-00005. PMID 12072662. ↑ "Eating, Diet, and Nutrition for Peptic Ulcer Disease". National Institute of Diabetes and Digestive and Kidney Diseases. Retrieved 28 February 2015. 1 2 Wang, AY; Peura, DA (October 2011). "The prevalence and incidence of Helicobacter pylori-associated peptic ulcer disease and upper gastrointestinal bleeding throughout the world.". Gastrointestinal endoscopy clinics of North America. 21 (4): 613–35. doi:10.1016/j.giec.2011.07.011. PMID 21944414. 1 2 Snowden FM (October 2008). "Emerging and reemerging diseases: a historical perspective". Immunol. Rev. 225 (1): 9–26. doi:10.1111/j.1600-065X.2008.00677.x. PMID 18837773. ↑ "The Nobel Prize in Physiology or Medicine 2005". nobelprize.org. Nobel Media AB. Retrieved 3 June 2015. 1 2 3 4 "Peptic Ulcer". Home Health Handbook for Patients & Caregivers. Merck Manuals. October 2006. ↑ "Peptic ulcer". Retrieved 18 June 2010. 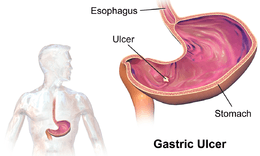 ↑ "Ulcer Disease Facts and Myths". Retrieved 18 June 2010. ↑ Cullen DJ; Hawkey GM; Greenwood DC; et al. (1997). "Peptic ulcer bleeding in the elderly: relative roles of Helicobacter pylori and non-steroidal anti-inflammatory drugs". Gut. 41 (4): 459–62. doi:10.1136/gut.41.4.459. PMC 1891536 . PMID 9391242. ↑ "antral mucosa - Humpath.com - Human pathology". web.archive.org. Retrieved 27 February 2014. ↑ "Stomach ulcer - Causes - NHS Choices". www.nhs.uk. NHS. 1 2 Fink, G (February 2011). "Stress controversies: post-traumatic stress disorder, hippocampal volume, gastroduodenal ulceration*.". Journal of neuroendocrinology. 23 (2): 107–17. doi:10.1111/j.1365-2826.2010.02089.x. PMID 20973838. ↑ Yeomans, ND (January 2011). "The ulcer sleuths: The search for the cause of peptic ulcers.". Journal of Gastroenterology and Hepatology. 26 Suppl 1: 35–41. doi:10.1111/j.1440-1746.2010.06537.x. PMID 21199512. ↑ Ryan-Harshman, M; Aldoori, W (May 2004). "How diet and lifestyle affect duodenal ulcers. Review of the evidence.". Canadian Family Physician. 50: 727–32. PMC 2214597 . PMID 15171675. ↑ Pennsylvania, Editors, Raphael Rubin, M.D., Professor of Pathology, David S. Strayer, M.D., Ph.D., Professor of Pathology, Department of Pathology and Cell Biology, Jefferson Medical College of Thomas Jefferson University Philadelphia, Pennsylvania ; Founder and Consulting Editor, Emanuel Rubin, M.D., Gonzalo Aponte Distinguished Professor of Pathology, Chairman Emeritus of the Department of Pathology and Cell Biology, Jefferson Medical College of Thomas Jefferson University, Philadelphia,. Rubin's pathology : clinicopathologic foundations of medicine (Sixth Edition. ed.). Philadelphia: Wolters Kluwer Health/Lippincott Williams & Wilkins. p. 623. ISBN 978-1605479682. 1 2 Salih, Barik; M Fatih Abasiyanik; Nizamettin Bayyurt; Ersan Sander (June 2007). "H pylori infection and other risk factors associated with peptic ulcers in Turkish patients: A retrospective study". World Journal of Gastroenterology. 13 (23): 3245–8. PMID 17589905. ↑ A, Sonnenberg; Müller-Lissner SA; Vogel E; Schmid P; Gonvers JJ; Peter P; Strohmeyer G; Blum AL (1981). "Predictors of duodenal ulcer healing and relapse.". Journal of Gastroenterology. 81 (6): 1061–7. PMID 7026344. ↑ Kato, Ikuko; Abraham M. Y. Nomura; Grant N. Stemmermann; Po-Huang Chyou (1992). "A Prospective Study of Gastric and Duodenal Ulcer and Its Relation to Smoking, Alcohol, and Diet". American Journal of Epidemiology. 135 (5): 521–530. PMID 1570818. ↑ Martin DF, Montgomery E, Dobek AS, Patrissi GA, Peura DA (28 June 2008). "Campylobacter pylori, NSAIDS, and Smoking: Risk Factors for Peptic Ulcer Disease". American Journal of Gastroenterology. 84 (10): 1268–72. doi:10.1111/j.1572-0241.1989.tb06166.x. PMID 2801677. Retrieved 18 March 2010. ↑ Kurata Ph.D., M.P.H., John H.; Nogawa, Aki N. M.S. (Jan 1997). "Meta-analysis of Risk Factors for Peptic Ulcer: Nonsteroidal Antiinflammatory Drugs, Helicobacter pylori, and Smoking". Journal of Clinical Gastroenterology. 24 (1): 2–17. doi:10.1097/00004836-199701000-00002. PMID 9013343. ↑ "Tests and diagnosis". Retrieved 18 June 2010. ↑ "ATLAS OF PATHOLOGY". Retrieved 26 August 2007. ↑ "WHO Disease and injury country estimates". World Health Organization. 2009. Retrieved 11 November 2009. ↑ Brown LM (2000). "Helicobacter pylori: epidemiology and routes of transmission.". Epidemiol. Rev. 22 (2): 283–97. doi:10.1093/oxfordjournals.epirev.a018040. PMID 11218379. ↑ "Peptic ulcer disease". Retrieved 18 June 2010. ↑ Rigas, Basil; Papavasassiliou, Efstathios D. (22 May 2002). "Ch. 7 John Lykoudis. The general practitioner in Greece who in 1958 discovered the etiology of, and a treatment for, peptic ulcer disease.". In Marshall, Barry J. Helicobacter pioneers: firsthand accounts from the scientists who discovered helicobacters, 1892–1982. John Wiley & Sons. pp. 74–88. ISBN 978-0-86793-035-1. ↑ Marshall B.J. (1983). "Unidentified curved bacillus on gastric epithelium in active chronic gastritis". Lancet. 1 (8336): 1273–75. doi:10.1016/S0140-6736(83)92719-8. PMID 6134060. ↑ Marshall B.J. ; Warren J.R. (1984). "Unidentified curved bacilli in the stomach patients with gastritis and peptic ulceration". Lancet. 1 (8390): 1311–15. doi:10.1016/S0140-6736(84)91816-6. PMID 6145023. ↑ Kathryn Schulz (9 September 2010). "Stress Doesn't Cause Ulcers! Or, How To Win a Nobel Prize in One Easy Lesson: Barry Marshall on Being ... Right". The Wrong Stuff. Slate. Retrieved 17 July 2011. ↑ Van Der Weyden MB, Armstrong RM, Gregory AT (2005). "The 2005 Nobel Prize in physiology or medicine". Med. J. Aust. 183 (11–12): 612–4. PMID 16336147. ↑ "Ulcer, Diagnosis and Treatment - CDC Bacterial, Mycotic Diseases". Cdc.gov. Retrieved 27 February 2014. ↑ Huwez FU, Thirlwell D, Cockayne A, Ala'Aldeen DA (December 1998). "Mastic gum kills Helicobacter pylori [Letter to the editor, not a peer-reviewed scientific article]". N. Engl. J. Med. 339 (26): 1946. doi:10.1056/NEJM199812243392618. PMID 9874617. Retrieved 6 September 2008. See also their corrections in the next volume. ↑ Loughlin MF, Ala'Aldeen DA, Jenks PJ (February 2003). "Monotherapy with mastic does not eradicate Helicobacter pylori infection from mice". J. Antimicrob. Chemother. 51 (2): 367–71. doi:10.1093/jac/dkg057. PMID 12562704. ↑ Bebb JR, Bailey-Flitter N, Ala'Aldeen D, Atherton JC (September 2003). "Mastic gum has no effect on Helicobacter pylori load in vivo". J. Antimicrob. Chemother. 52 (3): 522–3. doi:10.1093/jac/dkg366. PMID 12888582.